Lewis' Department Store, Fountain Square and Miles Bank, Hanley. 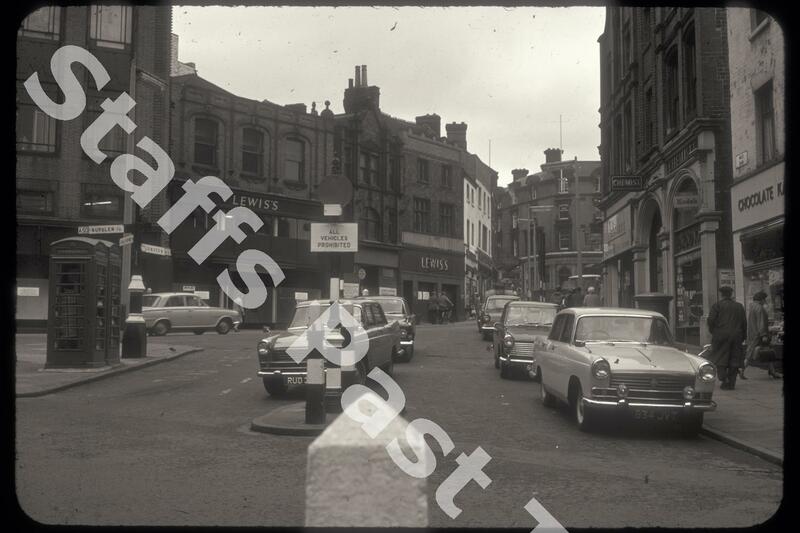 Description:The camera is looking from the corner of Trinity Street across Stafford Street. Straight ahead is Fountain Square. This view is obscured today by the arcade of shops on Moxon's Island. On the left is the original Lewis's store and just visible in Fountain Square, Pidduck's Jewellery shop. The shop was at the bottom of Market Square where it joined Fountain Square. The tall building in the centre was a branch of the Halifax Building Society. The short section of street in the foreground was known as Miles Bank. On the corner is Johnson's Cleaners and next door is a Chemist's, once Edmund Jones. The alleyway leads to Brockley Square. This Lewis's store was on the site of McIlroy's, Hanley's first department store and was opened in 1934. It was closed when a new store was built on Lamb Street in 1964.